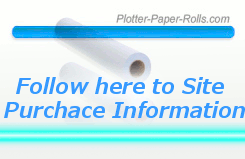 42 x 100 Plotter Paper 2 inch core, comes as 42 in. x 100ft. of 42 wide-format inkjet coated plotter paper – You can find universal American fitted inkjet plotter paper rolls ready to be delivered that fit your HP Designjet Inkjet plotter printer made specifically for wide-format inkjet printing – we can back it up with a 100 percent guarantee of satisfaction. You will find HP paper rolls here from an HP 2014 Channel Partner (approved vendor of HP) happy to give live support when and where you need it.